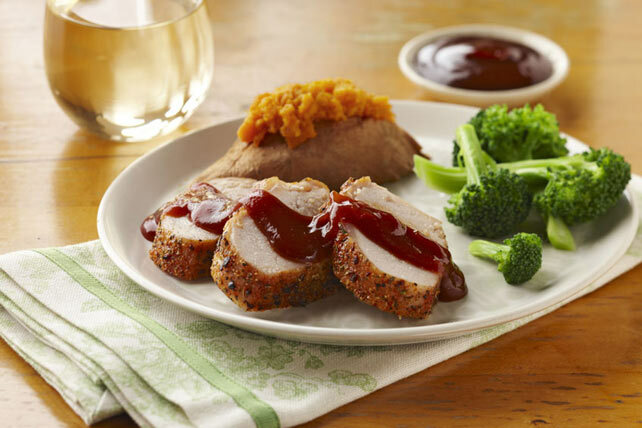 A garlic and herb rub, and 5 minutes of prep, elevates pork tenderloin to company status. Your guests will love that this elegant entrée is smart, too. Place meat in shallow foil-lined pan. Mix dressing mix and dry seasonings until blended; rub onto meat. Bake 15 to 20 min. or until meat is done (145°F). Remove meat from oven; let stand 3 min. before slicing and serving with the barbecue sauce. Use remaining dressing mix to prepare dressing as directed on package, using half each of the vinegar, water and oil. Store in refrigerator until ready to use. Refrigerate any leftover sliced meat to use to prepare sandwiches. Serve in toasted split sandwich rolls topped with chopped romaine lettuce.